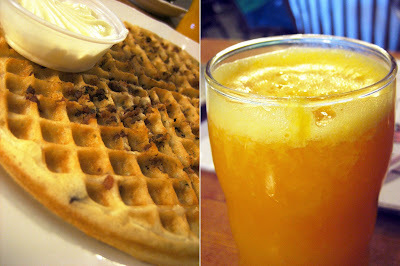 Like the food here, but dont you find it really expensive for what you get (breakfast food)? YUM!!!!! My kids went to private grade school righ across the street from there. Thanks for the invite...lunch was wonderful!! Now that I think about it, you're right it was kind of expensive for breakfast. The bill came out to about $10 to $12 per person. But since it was ten times better than Denny's or IHOP fare, I didn't mind so much. Glad you could make it! And thanks for the Lucca rec! That one's definitely on my list. I actually found the same thing here--that the pancakes were pretty good, but rather expensive. I think I had the Dutch Baby or something like that? It was like a pancake covered in powdered sugar that came, oddly enough, with a plate of lemons I think. Geesh one heart attack hash for me please with extra corn beef in it! ;-) I think I'm going to have to figure out how to make corn beef hash. wow a Bacon Waffle! How ingenious is that? I will have to try making some this weekend, yum! In my experience, waffles are usually slightly sweet, but does the bacon in it make it more savory now (and if so, does one add more salt into the batter or less sugar or do you keep it exactly the same and just add bacon?) or is it still considered a sweet food, despite the bacon? or is the bacon itself sweet as well? thanx for the post elmo! I saw a few pancakes that looked like huge tostada shells. I completely forgot to ask someone what that was. Could've been those Dutch Baby's you had. I like corned beef hash more than I like corned beef. And yup, it would be worthwhile to know how to make it like OPH. OPH's plate was something like $3 or $4, IIRC. It was quite crowded when we went. Surprisingly there was a great mix of people, I think half of the people in there were Asian. Weird! Leftover Bacon (crumbled) + waffle batter + waffle iron = BACON WAFFLES! As easy as that! If I had a waffle iron, I'd have started on a few plates already. It's actually quite savory. Kind of like a quiche almost -- a really crunch quiche that you put lots of maple syrup on. YUM! hmm.. there are some formatting weirdnesses going on and I don't know how to fix them because they only show up when i publish, not in any of the editting boxes.. @_@ any ideas how to fix it? [drooling] I love corn beef hash especially with a few shakes of hot sauce (Texas Pete) and some rye toast. I'm almost ready to throw in the towel with the low carb diet I'm attempting in order to eat a few bites of the hash. Can't fight it...must resist the hash. Speaking of chain restaurants, I am proud to announce that Century City is now home to a Pink Taco!!! I know you are as excited about having one in SoCal as we are of letting you experience the joys of such a ... um... interesting establishment. So, when will we see your review? Sorry for the late reply. I see what's going on with your formatting, but haven't a clue what's causing it. Perhaps there's a problem with the template? Try using another template (but save your link info before you do) and see if it makes a difference. Next time I'm getting the German pancakes for sure. And another side of that corned beef hash. Def one of those things you need to do before a day at Disneyland. The breakfast is better than those they put out at the Magic Kingdom, but the cost is probably just about the same. For pete's sake. Of all the chains to come out of Arizona, you'd think it could be one that serves cheese crisp. But if Pink Taco has it, I might just go and bite the bullet. Sadly, Pink Taco does not offer a cheese crisp. You still have to come to Phoenix for that delight. But, I really think you should venture up to Century City and do a review. Then, I will arrange for the therapy. LOL! Get the shrink couch all warmed up. First thing I'll try if I find myself in Century City will be a Pink Taco. I can't wait to try the product that inspired this quote from Ed Helms on the Daily Show segment about it. Ed Helms: "...this Pink Taco tastes like a**"
I went to the one in Redondo Beach but didn't recall bacon waffles on the menu! I'll definitely have to keep an eye out next time around. It's good! But then what which involves bacon isn't good? Oh I did! That would be a waffle gone that would kill me and then send me straight to heaven. Food is great, but the waitress there was horrible, and there are no A/C. I will not go back there...You should go to Aliso Viejo one! Much better service and taste good!!! 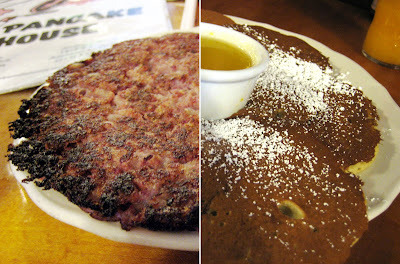 I agree the Original Pancake house in Aliso Viejo/ Laguna area is much better.. bigger and cleaner! The pancake staff in Anaheim isn't as friendly. It has gotten better now that the old lady (ie: pancake Nazi) is gone. She was rude! The belgium waffle at Anaheim though is way better than Aliso. Otherwise, both places are great! I agree that the one in Laguna/Aliso Viejo is much better. They offer specials, such as Eggs Benedict and Eggs Michael (mushroom sherry sauce on poached eggs over an English muffin), that the Anaheim one doesn't and the service is much better. There is also one in Yorba Linda, near corner of Yorba Linda Blvd and Imperial Highway. It's pricey but soooo good. Very busy, be prepared to wait on the weekends. The German pancake (big) and Dutch baby (small) are the best, very eggy, baked in the oven, served wtih butter, powder sugar and lemon wedges to squeeze over the sugar. It makes a tart/sweet glaze! We don't go there regularly since it is not close to our place. I make it a point to come every time I'm in the neighborhood. We get filled up and usually have leftovers to take home.